This private, prestigious condominium is located directly on the most beautiful white beaches of the Gulf of Mexico. Destin is located between Pensacola and Panama City Beach. The condo complex is conveniently located to the best that Destin has to offer. Shopping, dining, watersports, water parks, outlet malls, sports facilities, golf and tennis are all just a few minutes away. The property has a Gulf side pool/hot tub, Business Center, Meeting Room, and fitness room with cardio and weight equipment- including free weights. You can walk on the treadmill while watching the emerald-green waves kiss the sands of the Gulf Coast! When you are finished exercising, visit the gorgeous 'Harbor of Destin' for dinner at AJ's, chartered fishing, boat rentals, or a romantic dinner at '790 On The Gulf', the fabulous restaurant on premise. You will appreciate shopping at Destin Commons. One can simply walk to the Bass Pro Shops and 17 screen Rave/ IMAX Motion Picture Theater, located within this fabulous outdoor shopping and dining center. The Silver Sands Outlet Shops are just minutes down the street. You will find plenty of fine and casual dining in the area, and dozens of other beach activities close-by...everything to ensure a wonderful vacation. Unit 610 has been completely renovated (January 2013) and it is outstanding and gorgeous in every way. It is one of the most popular units in the building, being ideally located and on the west side with a balcony to let you share gorgeous sunsets with friends and family... or just the two of you! Unit 610 boasts of being the 'most rented' 2 bedroom/ 2 bath in the building for the past two years. You will enjoy the fine new furnishings, simple clean decor, completely renovated kitchen and baths with new cabinets and granite counters, and many other amenities which have earned this unit a 'Superior Rating.' Wake up to view the Emerald Coast Gulf waters in the large, comfortable, master suite area. A second bedroom has twin beds and there is a queen-size sleeper sofa in the living room. This unit is non-smoking and does not allow pets. Check-in time is 3PM, and check-out time is 10AM. You sure will enjoy the Gulf of Mexico from your Free Beach Set Up (2 beach chairs with a beach umbrella). The Inn at Crystal Beach- Unit 610 offers some of the finest luxury living accommodations in the popular Crystal Beach area of Destin. Uniquely classic in design, The Inn at Crystal Beach is truly a landmark in the area. Originally from Ohio, we are presently living in Destin, Florida, minutes from the Inn at Crystal Beach. 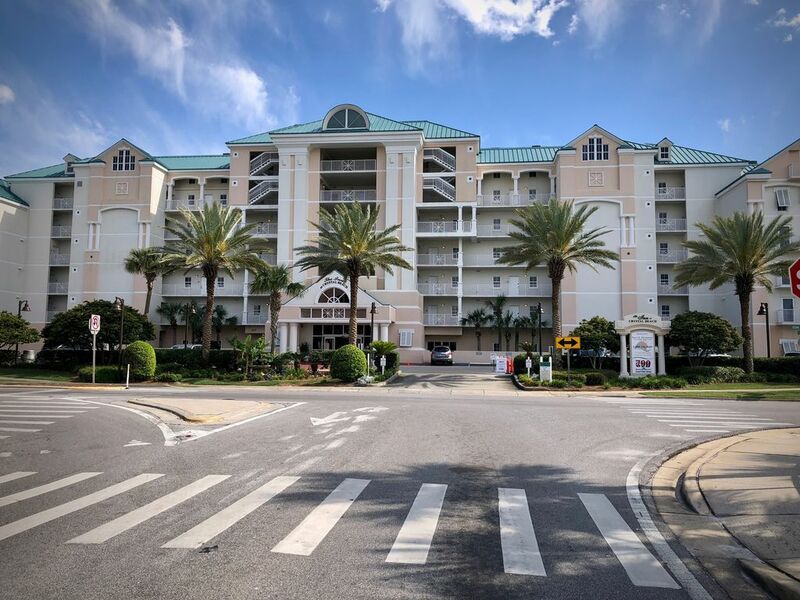 We are constantly checking and making sure that our condo is up to a high level of quality and cleanliness in order that you will be completely satisfied and enjoy your exceptional visit here in Destin, Florida! toilet, combination tub/shower, jetted tub, Remodeled in January 2013...Flat Screen TV in bathroom! We have our own private wireless internet service in addition to the service supplied by the main building. This helps with the 'overload' during the busy summer months. Regular Mr. Coffee and also a K-Cup Coffee Maker. Unit 610 has a Pantry. Newly remodeled kitchen as of January 2013...new cabinets, large granite countertop, 32' Flat screen, fabulous lighting! There are brand new 5 flat screen TVs in this unit... kitchen, living room, both bedrooms, and the master bath. Guests receive a Free Beach Setup (2 chairs + umbrella) Other activities in the area include miniature golf, The Track amusement Park down the street (rides and games for all), chartered fishing trips, shopping- Destin Commons, Silver Sands Outlet Mall, Restaurants galore- including 790 on the Gulf located on the first floor of the Inn, & much more. Be sure to stop at The HarborWalk Village. The Destin Harbor offers activities and entertainment to please each and every taste in your family—dive in and make memories that will last a lifetime. Here you can find waterfront shopping, water sports, boat, pontoon and jet ski rentals, world class fishing, aqua adventures, dolphin cruises, clubs and nightlife, weekly fireworks, seasonal festivals, live entertainment, and an array of restaurants to satisfy all tastes.